I found this picture on-line recently of a fuel injected 16-valve Sprint engine in a prototype SD2, which was ababdoned in 1975 or 6. Does anybody know anything about it's development? Did it die with the SD2, and that's why there's no injected Dolomite Sprints? That car is the Gaydon motor museum, i saw it last weekend. Worth emailing them to ask if they have any info or even if they will let you look round it? As it happens, I work with the nephew of the engineer who allegedly designed the system. His name was Carl Frederick Lloyd and sadly he passed away in Australia two years ago. After leaving Associated Engineering in the UK he moved to Australia to work for mitsubishi and lived out his retirement there. Anybody besides me wonder where the throttle body is on that engine? Also, the grille is Clearly badged Triumph 1500, does that mean they built a smaller version of the Sprint motor? It is a 2 litre Sprint engine I believe. instead they would have been fitted with O series engines. The TR7 also was destined to be powered by an O series. There is a bit about this in Graham Robson's book "Triumph Cars". It gives the costs of each engine and the slant fours were expensive against an O series. Does anybody have any more pics of the Sprint engine in the SD2? I'm specifically interested in what exhaust manifold it used, i.e. was it Dolomite, fabricated, or a different cast one? David Knowles quotes a Triumph engineer saying they were slide throttles. Sliding throttle bodies cannot be seen and are on the sprint f3 engine. I think he mixed up the engines. This one is similar to the tr7 L jetronic setup and at those it's conventional and below the plenum what also correspondence with the airfilter position. A chap I worked with until recently (he retired) told me about a 3 cylinder sprint engine that he worked on as an engineer, so I would say yes that existed. Only know of some three cilinder 1850's. 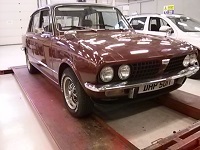 David Knowles states “Triumph engine development engineer Martin Smith remembers the project well: [']I worked on the Sprint EFI engine, originally destined for the SD2: it gave good power and was emissions-capable for North America. The inlet system for the SD2 used slide throttles (like a race engine) and was a very nice package. [']"
When did the development of this injected engine for the SD2/TM1, or any Sprint engine development work, stop? Knowles says it ended in 77-8 when the long strike was on at Speke. But I would have thought it would have ended much sooner than that, given the cancellation of the SD2 and TM1 in 1975, the 16-valve and tubo O-series engine development started in the mid 70s, what Don Ryder had said in 1975 about model and engine type proliferation at BLMC, and considering the almost modest £1.5 billion investment plan he recommended depended on the new BL doing what he'd said they should. I think someone isn't remembering well. The engine on the picture of that car has very obvious an L jetronic. It's the conventional setup. Sliding throttle valves do sit near the head. That isn't on that engine. The brake booster take off is on the plenum that only acts as a plenum as the throttle valve is before the plenum. This is exactly the tr7 L jetronic setup. Not a sliding valve engine. Only the sprint f3 has sliding throttle valves. Not all on the Internet is true. It doesn't seem to look much like the TR7 injection setups shown on the Internet. The one on the SD2 looks much more integral to my eye. And while I agree, only some of what is written on the Internet is true, the quote from Mike Smith is from Knowles' book Triumph TR7: The Untold Story, and does not necessarily relate to that picture of the SD2, which is the one at the BMM. I know that don't make what Knowles quotes Smith saying true either. It's just to clarify.